Debating the five best calibers for hunting Africa can easily become an exercise in futility due to personal preferences. The following information on the five best calibers for hunting Africa comes from 20 years practical, Professional Hunting experience in Africa. If the reader has other opinions, great. These are guidelines with what we have seen and experienced over time. Bearing in mind the minimum legal caliber for hunting African dangerous game in South Africa is the 375, we do not have much choice in this regard. A question often posed is if the 9,3 X 64 and the 9,3 X 74 are sufficient calibers for hunting African dangerous game? Yes, they are and yes they will. From this equation we left out shot placement, quality ammunition, shot distance and all other factors normally associated with comparing calibers on a scientific basis. As an explanation to the above: can you exceed the speed limit with a 1,4 liter 1985 sedan? Of course you can: but doing 58 in a 55 zone is still against the law. Another issue we are not going to argue is: which is best for dangerous game hunting 9,3 X 64 / 9,3 X 74 or 375. Refer to the last sentence of the previous paragraph. When looking at the five best calibers for hunting Africa we need to look at differentiating between the best calibers for hunting African plains game, and or, the five best calibers for hunting African dangerous game. For the aim of this exercise it is our choice to look at the overall five best calibers for hunting African game – dangerous game and plains game. 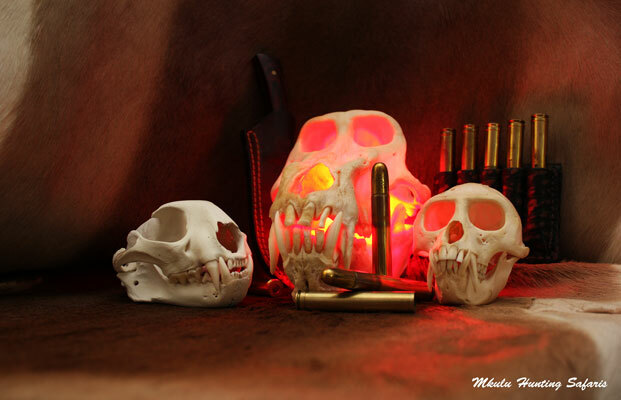 For a comprehensive list of calibers per trophy animal please follow this link. 458 Lott – this all round dangerous game hunting caliber packs enough gun to assist in any dangerous game hunting situation. The Lott is our personal favorite for dangerous game hunting in Africa. This is a charge stopper caliber. 30 – 06 must be way at the top of the general calibers. There are no plains game that have not been successfully hunted with the – 06. The 30 – 06 is as at home in the bushveld, as it is on the open plains of the Free State. 375 – the caliber that tamed Africa. The versatility of the 375 makes it an all-time great caliber. Load it with 300 gr projectiles and you can hunt dangerous game. Load it with 270 gr projectiles and you can hunt plains game. 243 – this smaller, long-range caliber is ideal for hunting the open plains of the Free State. It is a great flat-shooting caliber that can take down medium sized game from blesbok and smaller. It is also a great caliber for taking down wounded game at longer ranges and for varmint hunting. 22 Hornet – what a big little guy. This is the ideal caliber for hunting small game like steenbok, duiker and klipspringer on a windless day. The reason for suggesting this caliber is the absolute accuracy it is renowned for, and the lack of trophy damage caused by the projectile. We are extremely clear on the issue of what the best ammunition is for hunting in Africa. It is our recommendation for any hunter to only use premium grade ammunition like Nosler Partitions, Barnes TSX and TTSX, Federal Premium and Woodleigh. Field testing at the shooting range will determine which brand premium grade ammunition works best for accuracy in the hunting rifle you intend bringing over on your African big game hunting safari.